Saturday, I received an incredibly disturbing email from the Vice President of Flickr Brett Wayn. He informed me that my private photos on Flickr were available for anyone in the world to see. All my family photos that were set to private, some how, due to some bug, was visible to anyone in the world - anyone who wanted to see them. This is despite my privacy settings. How many photos to be exact? Well, 688 photos and videos. For how long was this an issue? Between January 18th and February 7th, 2013. They apologized and did respond to my questions throughout the night, on a Saturday night. I did post a more news-like post about this on MarketingLand. But this impacted me personally. 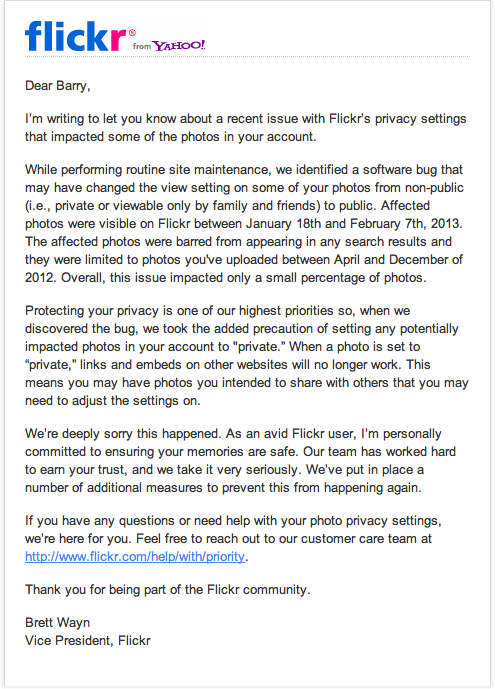 Flickr won't say how many users this impacted but there are a bunch complaining in the Flickr help forums. I should note, the images, although visibile to the public, were not accessible via Flickr Search or available to be indexed by search engines. At least that is what Flickr told me. Another issue, any images set to limited share that were embedded on third-party sites were all reset to private. So those images would display a broken image on those third-party web sites. Clearly, I am not happy about this. I am a Pro user and I've been a paid customer for several years. Forum discussion at Flickr Help & Google+.